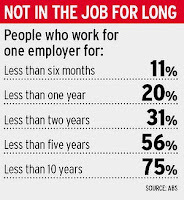 Australians who have been in their jobs five years or more are unusual. The latest comprehensive survey of labour mobility has found 56 per cent of Australia's 11.5 million workers have been in their jobs fewer than five years. And 20 per cent have been in their jobs less than a year. The Bureau of Statistics survey painted a picture of a labour market far more turbulent than the official employment numbers suggest. While total employment is said to have grown 77,600 in the year to July, beneath the surface about a fifth of the country's workers - 2.3 million people - gained and lost jobs. Women were more likely to change jobs and move in and out of work. And they were more likely to do it voluntarily. About 66 per cent of women who left work during the year to February did so of their own volition. Only 60 per cent of men went voluntarily. An estimated 240,000 men were retrenched compared with 149,000 women. Managers were those least likely to switch jobs, followed by professionals and clerks. Sales workers were by far the most likely to move on. Economists' guesses about the official employment numbers for last month, due out tomorrow, range from a drop of 10,000 to an increase of 15,000. The labour mobility numbers suggest that the true movements are likely to be nearer 200,000 Australians leaving jobs and about the same number moving into jobs. In last year's budget, the Treasury forecast jobs growth of 200,000 in 2011-12, or 17,000 a month. Instead, jobs grew by 47,000 - about 4000 a month.